A trip to Los Santos on the PS4 looks like being very special indeed. 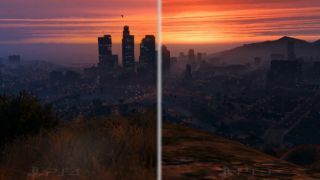 Rockstar Games has just revealed a new comparison video that demonstrates GTA 5's graphical jump to the next generation. The video shows the PlayStation 3 alongside the PlayStation 4 remastered version of the game, with the latter adding a significant layer of extra detail. And if that wasn't enough, there's the highly anticipated first-person mode to look forward to. Rockstar has confirmed that the blockbuster title will also be coming to both Xbox One and PC, running at 1080p resolution and 30fps. The PC version of the game will also support a 4K resolution mode. The next generation Grand Theft Auto 5 will land on November 18 for the PS4 and Xbox One with the PC version following in early 2015. Watch the video for yourself to see the changes.